Drug-smuggling puppies stuffed with heroin were discovered after the U.S. Drug Enforcement Agency busted a drug ring, the agency's New York division announced Tuesday. The DEA said 22 Colombian nationals were arrested for smuggling 20 kilograms of heroin into the United States. The smugglers, the DEA said, used both human and animal couriers or "swallowers" to bring heroin into the country. The street value of the heroin totals nearly $20 million, a DEA spokesperson told CBSNews.com, adding that all arrests were made in Colombia, except for one in North Carolina. Six pure-bred puppies were found with a total of three kilograms of liquid heroin packets inside them, according to the DEA. David Ausiello, a spokesman with the agency, told CBSNews.com that the packets were surgically implanted into the dogs in Colombia, then removed once inside the United States. Ausiello confirmed that three dogs had died, according to agents' reports. The exact number of dogs was unavailable. The investigation into the drug-smuggling ring began in April 2004 after an anonymous caller phoned a tip line in Medellin, Colombia, Ausiello told CBSNews.com. The DEA's operation ended Tuesday with the announcement of the arrests, which included 18 search warrants in six Colombian cities. Prior to Tuesday's announcement, the DEA said they have made 14 seizures of heroin totaling 24 kilograms and 21 arrests. The heroin was also found concealed in body creams, aerosol cans, as well as in the linings of purses and luggage, the DEA said. 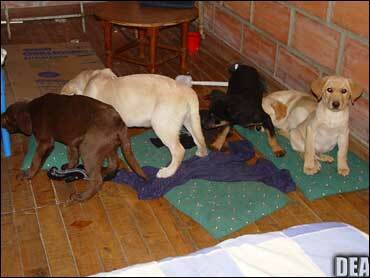 DEA agents have seen dogs used as drug couriers before, Ausiello says. But, special agent John P. Gilbride, who was in charge of the investigation, called the smuggling method "heinous." "The organization's outrageous and heinous smuggling method of implanting heroin inside puppies is a true indication of the extent that drug dealers go to make their profit," Gilbride said. The DEA said its field offices in Bogota, Colombia, New York, Miami and Atlanta aided the investigation along with the Colombian National Police Heroin Task Force and the Johnston County Sheriffs Department in North Carolina.